This is a life-changing month for me. On September 1, I am marrying the love of my life, Steven. I couldn't be more excited, nervous, peaceful, and thrilled about this special day. I have focused so much on our marriage, and not necessarily our wedding day in the last few weeks. I have spent a lot of time in the Word studying the Lord's design for marriage, love, and family. Marriage is a picture of Jesus' love and commitment to us . . . His church. David Kyle Foster of Focus on the Family says it this way . . . "In Ephesians 5:32, in speaking of a man and woman becoming one flesh, Paul says: This is a profound mystery—but I am talking about Christ and the Church. Isn't that beautiful? Our marriages should be a picture of the perfect love Jesus has for us! 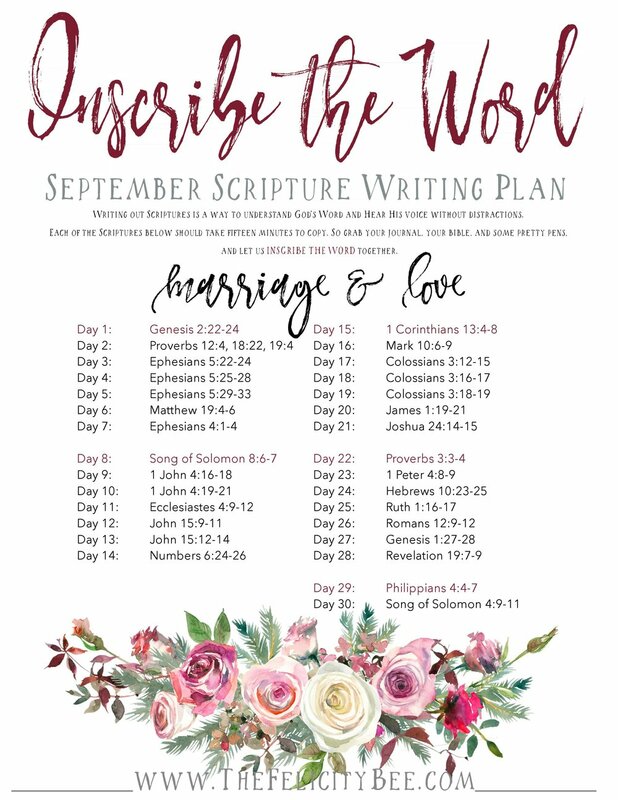 In light of our wedding, I wanted to focus our Scripture Writing Plan this month on "Love and Marriage". If you are married, I pray that these verses renew your love between you and your spouse. I pray they remind you of the deep love you have for each other and the deep love that Jesus has for you. If you are engaged, I encourage you to do this study with your fiancé. Start your life off with the Word of God so that you can understand HIS pattern for marriage. You will see Jesus in each other and His love for you in your love for each other. If you are single, I pray that these verses remind you that your husband is Jesus. (Isaiah 54:5) My hope is that you see His divine love for you in every single verse. If you are hoping for a husband one day, why not start a "Future Husband Journal". Start a journal of notes, prayers, and Scriptures for your future husband. On your wedding day, you can give your journals to him as a gift. These Scriptures will make a great start! Happy September, dear friends. I covet your prayers as Steven and I start a new life together. Click Here to download your September Plan. CLICK HERE to download your KIDS September Plan.